We at Pravah, through our different programs work towards our vision of building ‘youth leadership for social change’. Based on our experience and research, we define this ‘leadership’ as a combination of self awareness, relationship skills and impact on society. Since we believe that change in society begins from change in self, our programs begin from ‘self’ and then take young people to social action… this journey from ‘me’ to ‘we’ is at the core of all our work. Since a large part of our work focuses on personal self of young people besides social action in the outer world, for years we have tried to offer young people enjoyable and enriching experiences of self awareness and in this endeavor we have been able to develop what we call- INWARD BOUND! Inward Bound is an interactive exhibition aimed at enabling young people to gain a better understanding of themselves. It consists of a mix of games, inventories and reflective exercises that students can experience on their own. The whole experience is physically located in a tent-like structure where young people come, explore and walk away with greater awareness of themselves! We take inward Bound to different colleges where we meet a sea of youth who go through different psychometric tests as they go through the colorful tents and as a result develop a better understanding of their personality, leadership and interpersonal skills. We have taken Inward Bound in colleges like Kirori Mal, Miranda House, IIT, Indraprastha, Dayal Singh, Zakir Hussain and others and people have loved it. Here is sharing a write up written by Aashima (NSS- coordinator) of Indraprastha College on Inward Bound in her college. Inward Bound that was organized by NSS in IP College on 24th September, 2011 saw a hoard of students eager to embark on the journey from Me to We. 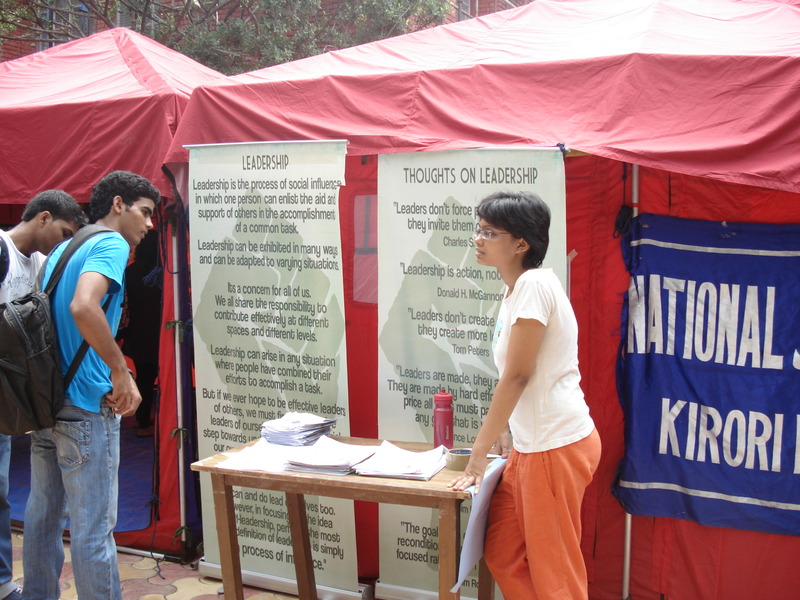 It was an interactive event which saw mass participation from the students as well as the faculty. We started early in the day and the program stretched well into the afternoon. The NSS Unit of IP College was present throughout the day with volunteers coming to help with the setup and to assist the Pravah team and making them feel at ease. The whole experience was one of its kind with attractive tents standing in the middle of the sports field pulling students towards it. In the first tent they were made aware of their personality types, why were who the were and what made them behave in the way they behave to a specific stimulus. 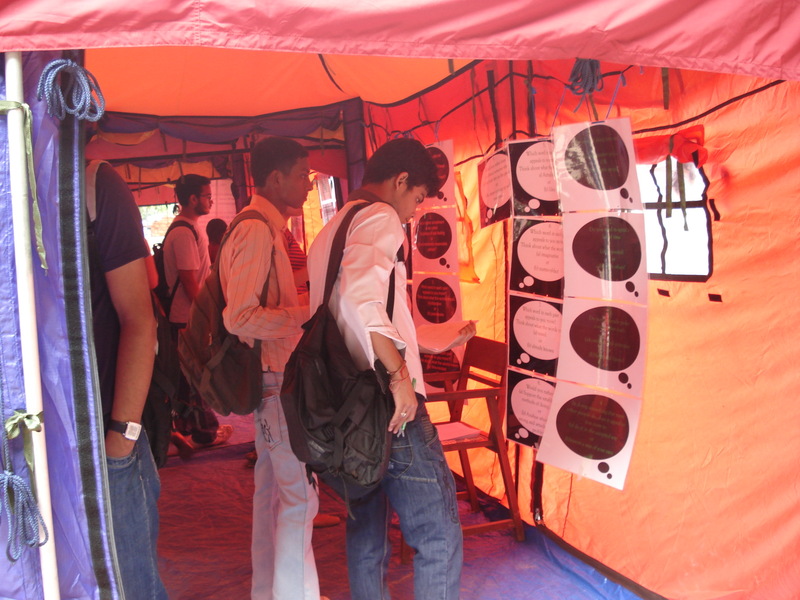 The first tent gave way to the second in which leadership and learning skills of the students were analyzed. 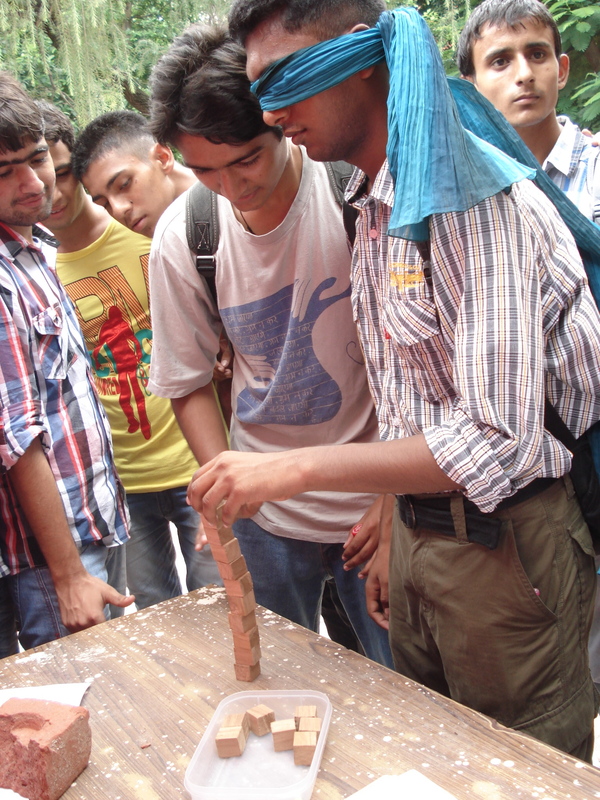 The ‘tower making’ game attracted a hoard of students which mixed fun with self awareness. 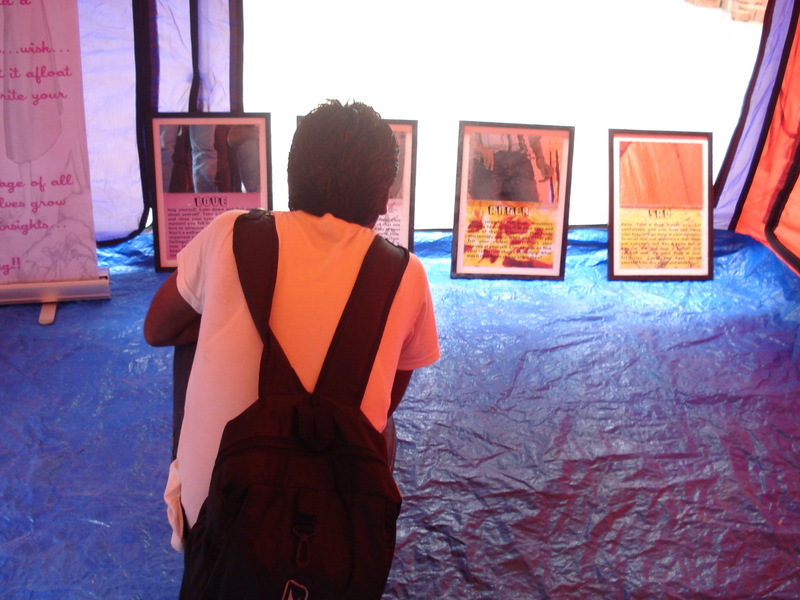 Many among the students were interested in knowing or working further with Pravah. The team answered all their queries and created a database of students interested in working along with Pravah in its various programs. The feedback from the students was ecstatic. The students felt immensely pleased with the experience and they came out with a better understanding of themselves. Aakriti, a student of 1st year English honors said that she now knew which kind of people would she work well with and why. Sayantani of B.Com also thought that the program was highly beneficial in making her understand why she gelled well with a certain type of people and not others. “ I have struggled to know why I cant work with my sister, I know now that we are two completely different personalities and we do not ideally gel well, now that I know this I will take care to avoid the things which create tension between us” – Divya Mehrotra. All in all Pravah’s first program in IP college was a huge success and laid down the foundation for further collaborations. It was a joyous, fun filled day for everyone involved which ended in everyone leaving with a smile on their faces.